November is the spring shoulder season in Botswana, a time of soaring thunderclouds, returning migrant birds and, once the rains arrive, fields of new-born calves. It’s still very hot, with daily highs of 35°C to 40°C across the country, and it can get even hotter in the north where nights are humid and often well over 20°C. 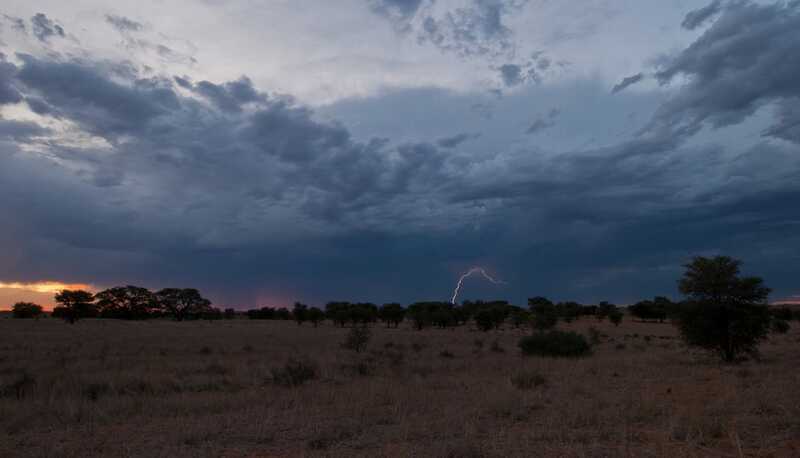 The start of the rainy season is always hard to predict, but good years can see early November rainfall in the south and central Kalahari, while Moremi and Chobe usually have to wait until later in the month. November is all about when the rains will begin and when they do arrive it’s with a literal bang. Before the first thunderstorms, conditions are much the same as October, with increasingly desperate animals drawn to whatever permanent water sources they can find. Waters in the delta continue to recede, opening up the flood plains and providing essential, fresh grazing. The Chobe and Linyanti river banks are by now crowded with game and large numbers of elephant congregate on the waterways. Once the rains do come the relief is palpable. The dust clears from the skies, the pans begin to fill, and the antelope birthing season begins. If there have been early rains, this is an excellent time to visit the Central Kalahari, where enormous herds of oryx and springbok attempt to protect their new-borns from prowling cheetah and lion. Road conditions are still reasonable at this early stage of the wet season and you can still drive confidently without worrying too much about getting stuck.